In early October, my good friend Mike and I discussed ¡Uno!, the first of Green Day's trilogy album release. Earlier this month, ¡Dos! was released to the masses and Mike and I teamed up to give our thoughts on what has been referred to as the "sophomore slump" of the three (so far). With ¡Tre! planned for next month, expect a return to conversation - as well as a recap of the trilogy as a whole. But for now, discuss with us all things ¡Dos!. Mike: So Dos, the meaty middle of Green Day's three-album trilogy, has finally hit the net. Proclaimed to be the raw, dirty, party album of Green Day's wildest impulses, I'd say the album largely lives up to that billing. After listening to Uno, and from what I've heard from Tre, it's clear that Dos is firmly rooted in 50s-60s rock n' roll yearning, married alongside some of the band's most snarling performances. 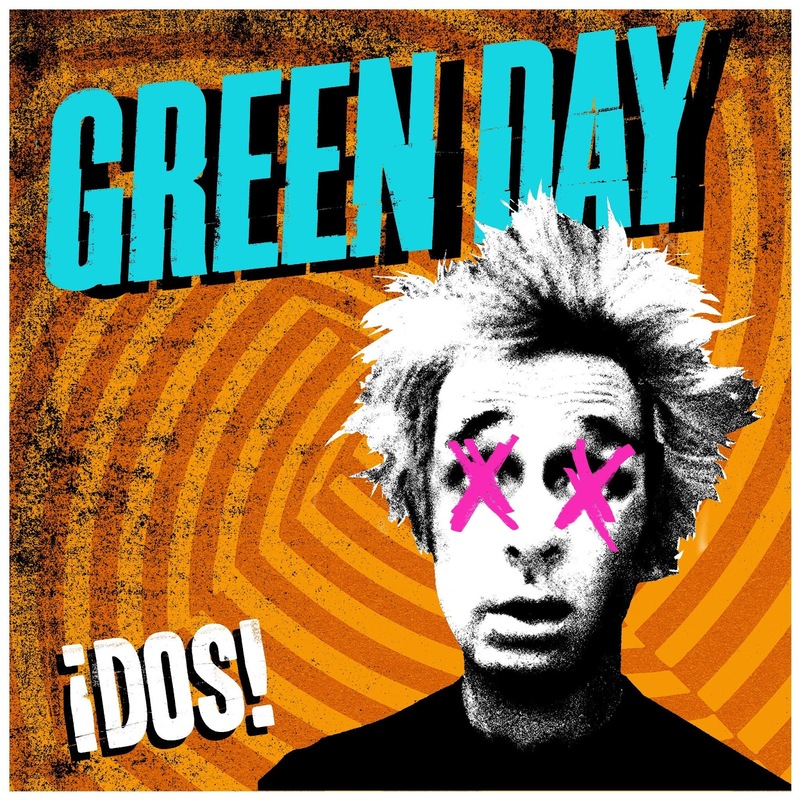 Though the group doesn't channel the same kind of rage and intensity like on 1996's Insomniac, this is easily the most punchy record Green Day has put out in years. The thing that impressed me most on first listen, and what I DIDN'T get from Uno, was a sense of recklessness from these songs. Billie Joe Armstrong's guitar slashes, burns, and blisters; Mike Dirnt's bass flutters and booms; and Tre Cool's drumming is relentless. The songs themselves are sinewy and lustful, a stark contrast to Uno's often chunky arrangements and power-pop push. Matt: I have to say upon first reading this that I didn't have the same reaction you did. I was under the impression that Uno had a bit more, shall we say, swagger about it. And on first listen, Dos seemed a little slow. But then I went back and listened to Uno again and then back to Dos and now I definitely see what you were saying. When I think of Uno, I think of "Let Yourself Go," easily one of my favorite Green Day songs and that's where I see all the snarl. But a trip back to the album made me realize that it was full of almost "safe" songs. Mind you, they were still good. But Dos does turn it up a notch, maybe not with the actual volume but with the intensity of the lyrics and the feeling. The 50s-60s rock n' roll sound you spoke of reminds of some of their Foxboro Hot Tubs work. As we begin to talk about songs, let's start with the elephant in the room. What are your thoughts on "Nightlife?" Mike: It's interesting you bring up the Foxboro Hot Tubs vibe because Billie Joe said Dos was essentially the second FBH record. I'd also like to add that when Green Day were teasing us with the prospect of 3 new albums, they kept saying they'd sound like the Beatles meets AC/DC. For my money, Dos fits that description perfectly, jagged guitar lines and messy blues-splattered solos, coupled with Fab Four earnestness. I can see your point about having a slower vibe than Uno. Where there's a bouncy, buoyant quality to Uno's tracks, songs like "Lazy Bones," "Stray Heart" and the hilariously titled "F*** Time" sport some tremendous build ups. I supposed with the exception of the twisted "Makeout Party" and the White-Stripes-from-Hell thrash of "Lady Cobra," Dos isn't a very fast record. I guess for me, its intensity seems more apparent because these choruses explode, awash with powerchords and layered backing vocals. Which brings us to the late album ugly duckling: "Nightlife." I'll go on record in saying the rap doesn't work. It opts for sleazy, but comes across cheesy. With Lady Cobra talking about sugar towns, it's really hard to take this song seriously, feeling more like a group-wide double-dare contest that went too far. That said, there are some interesting things happening musically, some hefty low-end and some flange soaked spy-movie guitar. Sort of reminds me of a dubbed-out version of "Espionage" from Shenanigans. Despite the rather upbeat quality of some of these tracks, what do you think of the sinister hedonism hinted at with "Amy" and "Nightlife" in light of Billie Joe's recent rehab stint? Foreshadowing or spooky coincidence? Matt: Short answer - the spookiest of coincidences with a little bit of foreshadowing. Knowing what we do now, it almost seems like Billie Joe is talking to himself in a way and oddly the timing of the release couldn't have been more perfect as it helps take Dos up a notch. I was waiting for us to bring up "Amy" because it's one of those songs where I instantly loved it the first time I heard about it. There's something heartfelt about it and it doesn't steer too far in the direction of sappy. For what they were trying to do, I have no problem saying it was a damn near perfect song and will go even farther as saying it was a top song of 2012, I like it that much. The motives discussed with "Nightlife" and "Amy" do help to paint a slightly darker picture than the kind of upbeat stylings of "Stray Heart" and "F*** Time." I think "Nightlife" goes well with your point of the Beatles meets AC/DC influence in that yes, the song is all kinds of cheazy, sleazy (pimping ain't easy) but it's also fun and definitely not what you would expect from Green Day. So for at least one track, there are no comparisons to bands of yesterday - No Clash, No Ramones - and for once they have a song that is all them. I think for that reason and that reason alone, it works. For one track out of an album full of really strong ones, a favorite being "Lazy Bones," it helps to show their range. I do like the nod of a dare gone too far and while I don't want to see it again, I think "Nightlife" fits where it was. Also, it shows a bit of a branching out, much like I felt with "Troublemaker" on Uno. With that said, the two albums seem a bit similar and it's looking like Tre is going to be less of a final chapter and more of a simple Part 3. And that's not a bad thing. Mike: I think it's interesting that you brought up the fact that our other punk comparisons aren't necessarily apt for Dos. This album definitely sports more of a rock n' roll vibe, the difference between The Jam and the Ramones I'd say. The other big difference I hear on Dos is the sense of desperation vs. this sense of confidence we hear on Uno. From the yearning found on the back of "Lazy Bones'" three-part harmonies, to the reverb twitch and moan of "Amy," Dos is a decidedly more insecure batch of songs. This LP exudes confusion, from its schizophrenic bass lines to its rapid fire drums. There's an insistence on Dos that whatever existential ennui is bugging Billie Joe, it seems to be all consuming. "Stop When The Red Lights Flash" really embodies this for me, with its relentless riffing and gang vocal shouts of "I'll make you/Surrender!" While I agree with you that Dos never verges on sappy, I do think the album is hampered by it's "party from hell" vibe. By that, I mean you can't divorce the songs from the adolescent rambunctiousness that birthed them. Setting aside how imperfect "Nightlife" is, the thing I struggle with on Dos is HOW adolescent some of these feelings are - and the 40-year old man they're coming from. Whether it's the spin the bottle references on "Makeout Party" or the riot grrrl pining of "Ashley," the strength of Green Day's post-Warning material has always been the scope and breadth of Billie Joe's writing. With a few exceptions, that's largely absent on Dos, and the band opts for something immediate and splashy. While I can see Uno having more staying power for me, I do think Dos sports a more immediate sonic sugar rush and that accessibility that will endear it to old and new fans alike. In no uncertain terms, the fuzzy-punk freakout of Lady Cobra is exactly what I needed from Green Day. Coupled with Uno's energy, Dos' looseness sets us up for an interesting time with Tre, a record that the band has described as sobering. Even through there might be a few more warts on Dos, maybe that's the point of this LP. After over 2 decades in the limelight, Green Day have certainly earned some fun, and it's pretty exciting to hear them so enthused.